Buy, swap and sell at the Mandurah Rotary Swap Meet located at the Lakelands Shopping Centre – North Carpark. 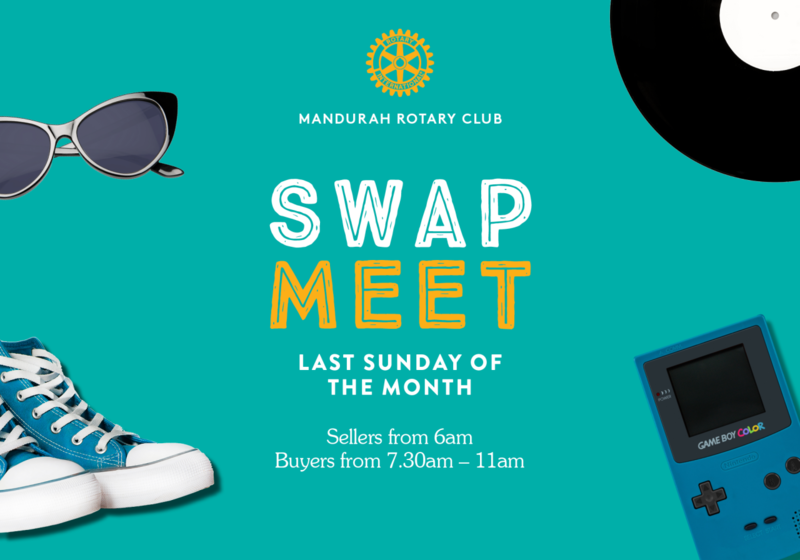 Organised by volunteers of the Rotary Club of Mandurah , the Swap Meet will be held on the last Sunday of the month. The Swap Meet is a fundraising activity of the Mandurah Rotary Club and all proceeds go towards the Club’s projects. Buyers: Swap Meet opens at 7:30am to buyers. Entry is a gold coin donation. Sellers: Sellers are admitted from 6am. Sellers are charged $10 per bay occupied. The Department of Commerce allows the sale of pre-used goods (secondhand goods) only. By law, Swap Meet sellers are not permitted to sell food, new goods or craft work. Please report any incidents to the organisers on the day. For public safety, sellers are not permitted to move their vehicles between 7.00am-11.00am.